iKlip - World's Fastest Apple Lightning Flash Drive for iOS devices. Quickly transmit data between iOS, iPhone, iPad, Mac and PC without using internet, cloud system, or iTunes! Transfer anything from your computer to iPhone or iPad. And vice-versa. For storage, photos, movies, music, transfer and backup. 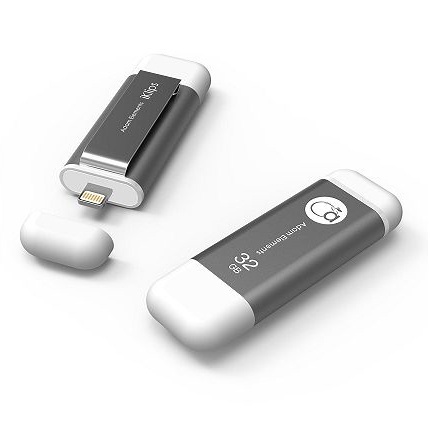 With Lightning connector, USB 3.0, exFAT support and an extra-special clip design, it’s a flash drive like no other. Engineered to support USB 3.0. The first and only of its kind. That means mega-fast transfer speeds on those big files. Less waiting, more doing. We like being the first. And the best. So iKlips supports exFAT, while nobody else does. Using exFAT means there’s no limit to individual file sizes. Other drives with FAT32 have a 4GB size limit - probably not even enough for a HD movie. For the best, go to Adam Elements. Fully certified and licensed by Apple as a product Made for iPhone, iPad & iPod. Designed specifically for Apple, iKlips meet strict performance and manufacturing standards and are backed by Adam Elements’ highest level of quality assurance. Always check for MFi. Don’t trust anything without it. Sharing should be simple. It doesn’t get much simpler than this. Klip it, save it and share it. Give your iKlip to your friend and what’s yours becomes theirs. Photos, documents, movies, whatever. Magic. More of your stuff. On your iPhone. Or your iPad. Because space can get tight in there. With iKlips external storage, you don’t need to leave your movies and TV shows behind for that flight. Open files directly from iKlips – doesn’t matter how much space is free on your device. Award-winning lightweight aluminium design with a built-in clip on the back. Clip it to your bag or pocket. It's hard to lose. And that's a good thing.